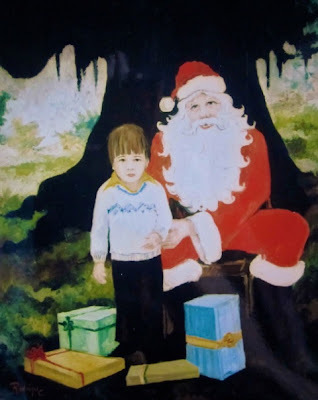 In 1979 George Rodrigue painted his four-year old son André with Santa Claus. As with most of his Cajun paintings, he manipulated a photograph to suit his needs, in this case cutting the figures out of the staged snapshot and placing them outside. André posed with Santa not beneath an oak tree, but at Acadiana Mall, which opened in Lafayette, Louisiana that same year. To create the painting, George projected the figures onto a 40x30 inch canvas and traced their outlines. He then formed the tree behind them, so that they appear to be pasted onto this symbol of Louisiana, leaving no doubt that this is a Cajun Christmas. How did you get him to pose with Santa? Typical of George’s style, the sky is small and bright in the distance. The figures shine with an unnatural light, as opposed to the expected shadows beneath the branches and moss. The Cajun culture and the Christmas tradition are the subjects here, as André and Santa glow like ghosts, timeless in a Louisiana landscape. Tell me about Santa and your own childhood, I asked George. “I never saw a dressed-up Santa Claus as a kid. They just weren’t around. The cut-out Coca-Cola Santa from 1950 is the first one I remember. He was much bigger than I imagined. 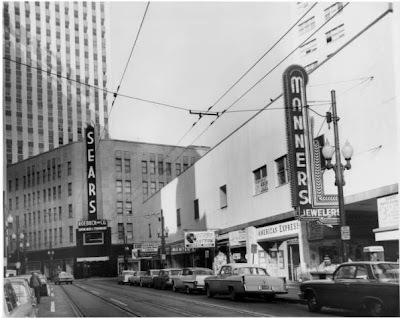 “In the ‘50’s, the Sears, Roebuck building at the corner of Baronne and Common Streets in New Orleans had a four or five story Santa Claus. It was so giant that you could see it from Canal Street. “I got real ambitious and went for a giant Santa like the one at Sears in New Orleans,” he explains. Because of his dad’s connections in the tomb business, George had access to huge cardboard boxes, used to transport and protect the caskets for Evangeline Funeral Home. He attached Santa to his house in real life just like he pastes his figures on the oaks in his paintings. To further complicate matters, he stapled a clear plastic sheeting to each section of cardboard, protecting Santa from the weather (a hard-learned lesson after losing a panel in a rainstorm the first night). The whole project took two weeks. 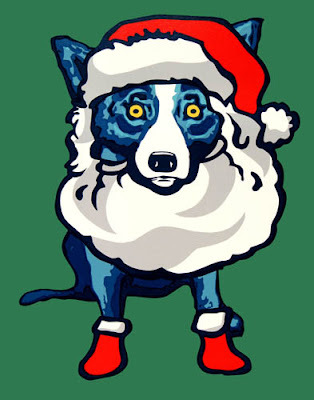 “In the end, it was like the Sears Santa,” George recalls. “You could see it all the way from Main Street. Must have been the biggest Santa Claus ever put up in New Iberia. I didn’t win anything and had no mention in the paper, but everybody came to look. Today our decorations are unworthy of a home-tour. That's because George leaves the responsibility of our holiday atmosphere to me. Stuck on traditional red bows and garland, plywood and twenty-foot Santas are out of the question. This year, for the first time ever, we forwent the tree, as we’re already on the road, heading West for a white Christmas in Santa Fe, New Mexico. Before we reach the adobe houses, luminaries, and snow, however, we’ll stop for the weekend in Marfa, Texas, checking out the Chinati Foundation, a series of buildings housing a contemporary art museum founded by New York artist Donald Judd in 1979. *Guapo ('handsome' in Spanish) belongs to Dana Waldon and Doug Magnus. 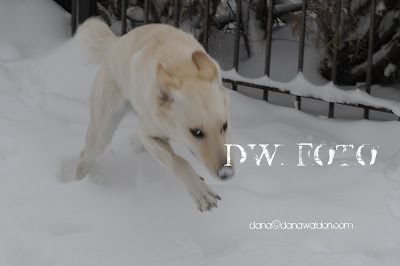 "I let Doug name him," jokes Dana, "because I thought it might give the dog a better chance of Doug not killing him!" OK- I have to completely disagree about the decorations. Now, this year is an exception, but normally there are several trees-- bright pink, blue and red ones go right along with the traditional beauty. Wendy puts sparkly butterflies and lights in the garland on the staircase. It's wondrous and inviting!! There's also the life size talking/singing Santa guarding the foyer. My boys were scared of it for years!